A recent article confirmed that the number of high school students with credit cards has tripled in the past two years. This growth in teen credit card debt shows a lifestyle of instant gratification and the inability (or unwillingness) to live within one’s means. 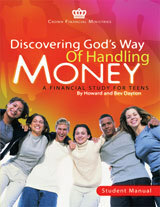 The revised 10-week edition of Discovering God’s Way of Handling Money Teen Study is designed to practically help teens create habits that will set them on a lifelong journey of handling money responsibly.